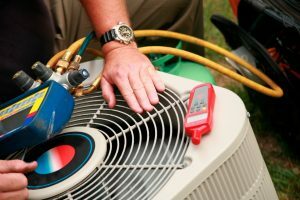 Air Conditioning Repair Calls May Need to Replace Your System Instead | Clean Air Act Inc.
We’ve officially arrived at the end of summer, with accompanying cooler weather and a reduced workload for your air conditioner. Older systems that have labored over the summer will finally see less use, which means that now is the perfect time to schedule a repair call to address any lingering problems that may have affected it over the summer. But what if repairs aren’t the best option? For older air conditioners, it might be a better idea to replace them instead rather than pay for repairs and force them through another hot season next year. If you need to install a new system, now is the perfect time to do so, when you have plenty of time to plan for the new system and schedule an installation at your leisure. But when is replacement necessary and when can you get by with repairs? Only you can answer that question, since every air conditioner is unique and you are likely more familiar with the state of yours than a repair technician. Repair services can provide strong guidelines, however, and in general, you should look for some of the factors detailed below. They can help you make an informed decision as to the right way to proceed. Is the Warranty Still Good? A/C warranties protect you from the cost of replacement parts for a given period of time (usually 8-12 years, though the exact length varies by make and model of the air conditioner). So if a part breaks down — assuming it’s the original part in place when you first bought the system — it won’t cost you anything to replace it beyond the cost of labor and perhaps a few incidentals like bolts or wires. As long as the warranty is in place, it’s usually best to repair the problem rather than replace the system. Indeed, even if the warranty has expired, a repair job is still probably in order as long as the costs are kept down. Only when the costs rise and the warranty has expired should you consider replacement. When Do Costs Get Excessive? Again, only you can determine whether the cost of repairs is more than the system is worth and would be better spent investing in a new system. However, there are some factors that can help you decide. Cost of Repairs. This can mean a single repair job that is simply more expensive than the system is worth, or it can mean multiple smaller repairs piling up faster than you’d like to handle (usually more than two repair calls in a single 12-month period). Monthly Costs. Air conditioners lose their efficiency after a while, though you can mitigate that with regular maintenance calls. Regardless, if the cost of running your air conditioner was higher than you were comfortable with this summer, a new system may be the ideal way to relieve that pressure. If you’d decided to replace your air conditioner in the Gresham, OR area, the friendly pros at Clean Air Act, Inc. are standing by to help.